Chelsea have a tough nut to crack in a bid to sign Brazilian forward Willian who is reportedly close to an exit out of Manchester United. Chelsea have so far valued the forward at a premium fee of £65 million to discourage clubs from swooping the player. Chelsea had earlier rejected two bids worth around £55 million from Barcelona which led to the Catalan giants signing Malcolm from Bordeaux. According to Spanish tabloid Mundo Deportivo, Mourinho wants players that he can trust and is willing to sanction the purchase of Willian for the asking price of £65 million. Mourinho has had high-profile fallout with players during his 2-year stint as United Boss with Anthony Martial a key example. Willian is a stalwart of Mourinho and the Brazilian admitted in an interview with Goal of his admiration of the Portuguese tactician. “There were a few conversations with my agent. I worked with Mourinho and I became his friend as well,” “He likes me a lot and I like him a lot as a coach and as a person. Willian will improve United attack immensely as the club are in dire need of creative players who can help outscore their opponents. 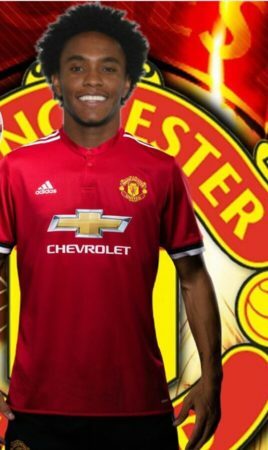 The pacy forward can fill this void and here’s how Willian wil look in Man United shirt if he joins the club. United finished 19 points adrift of league leaders Manchester City last term.